Heineken takes the bullet followed closely by Chip Wasson. 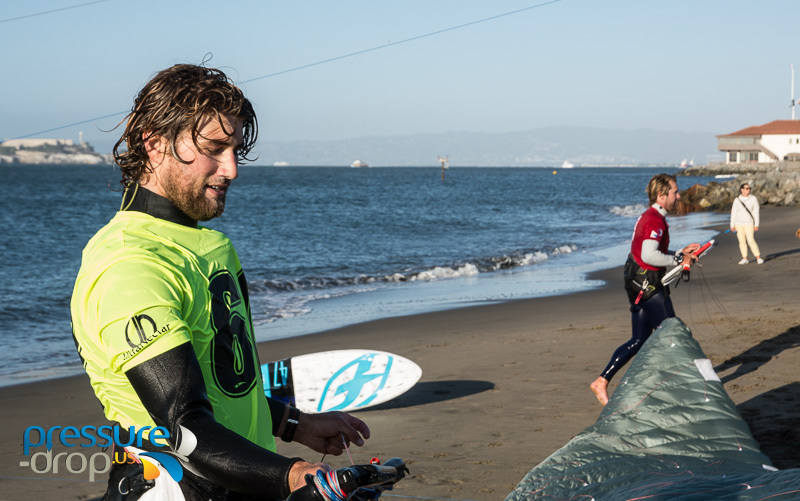 "Come for the fizz, work through the fizzle"
31 Foiling Kiteboard, 7 Foiling Kites, 11 formula and foiling windsurfers, 10 Eighteen foot skiffs and 5 boat menagerie that included the classic 65' Spencer. Ragtime, Don Montague's foiling kite boat and a modified Vanguard 15 that had undergone reassignment surgery and reemerged as a kite boat were among the plethora of entries to enter the 2015 Ronstan Bridge To Bridge sprint from the Golden Gate Bridge downhill to the SF/ Oakland Bay Bridge. As the afternoon progress and eager contestant rigged their rides, San Francisco Bay began showing signs of the fury she is capable of producing. Winds, building to the mid twenties and the beginning of the ebb tide were giving pause to the experienced and the new to event contestants. "Will it continue building? Will it lighten? How big will the ebb get? These are all considerations and concerns for the B2B. Too much sail area and you will get rag dolled down the course. To little and you might be wallowing in misery outside the Gate or near the finish at the Bay Bridge. Chip Wasson who recently turned 50 has been sailing these Bridge to Bridge events since its inception 1st on a windsurfer and later winning the event as one of the 1st Kiteboard ever to enter, a twin tip and a Wikipa Kite. " I remember some of the Aussie's talking to me before that race" Chip recalls ( apply Aussie accent) "Hey Mate, you can't be serious about trying to sail that contraption in the Bridge to Bridge, The Eighteens are the fastest thing around, you avant got a prayer"
Chip was out testing the waters prior to event, looking for the proper size kite, while many on the beach awaited his estimation before rigging their own gear. " Can't be sure, a 10 meter or 11 meter" was Chip's best guess. Fast forward to the 5:30 PM Start just outside the Gate. With the board contingent to the North, The 18's in the center and " Other Ones" to the south, a slight delay ensues and almost predictably, traffic delays the start. The ebb continues to build and the breeze, unpredictably begins to lessen. Maintaining position and getting a clean start is the essence of the Bridge to Bridge and can make the difference between success and wallowing in misery. The gun fires and they are off! Better than us describing what ensues, we have assemble a few video interviews to allow the players in the game to give you the low down on the ho down...with more to follow! Stay Tuned! Josh McCormack gives Pressure Drop the Readers Digest Version on Yamaha's afternoon ride from the Golden Gate to the Bay Bridge!